The map shows campgrounds as yellow dots and towns as red dots. Total distance: 850 km. Tour date: July/August 2002. 27. My tour started at noon from San Rafael, where a friend keeps the bike that I use when in the Bay Area in storage. San Rafael is in Marin County just north of San Francisco, about an hour on an express bus. 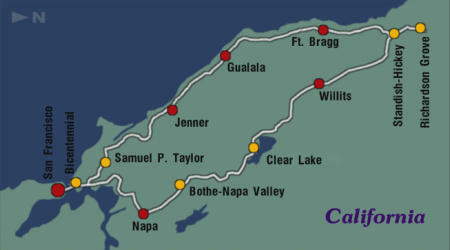 Getting to Napa is not easy because highway 101 is a freeway that is not legal for bicycles here, so I kept using the nearest regular road to the west. There is no road from San Rafael north to Novato, but fortunately there is a bike path parallel to 101 here, with signs. I used Ignacio, Sunset, Novato, Olive, and Atherton to get on highway 37, which is a detour but avoids part of the busy 37. A friendly local cyclist showed me the way. I turned left on 121, and right on 12/121 to Napa. In the city of Napa, there is a friendly tourist info downtown on 1st. Stock up on food here because I haven't seen another grocery store for the rest of the day. I decided to take Silverado Road north, because unlike highway 29 it has a wide bike lane and is more scenic. There are beautiful vistas of vineyards and hills all the way. 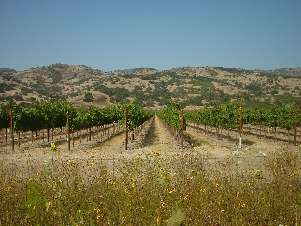 The picture on the right shows a vineyard. I was warned that both can be dangerous because the Napa valley is California's wine country, which means lots of drunk drivers, but I saw no evidence of that. 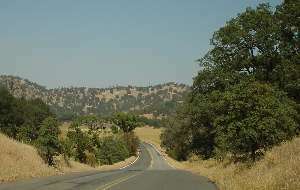 I cut back to 29 on Bale St, and stayed in the Bothe-Napa State Park. One night costs $1 (like in all State Park campgrounds except the Bicentennial which was free), plus showers, and they never turn cyclists away. 28. I continued north on 29 the next morning. After about 6.5 km after leaving the campground 29 turns right into Calistoga, a nice small town with a supermarket and restaurants. After leaving Saratoga, 29 climbs 660 m in a long sequence of scenic switchbacks, with many views of the Napa valley. There is a sign to the Robert Louis Stevenson Park at the summit, and a short footpath leading to a quiet and shady rest area with picknick tables. No campground. A glorious downhill follows, with wide turns but some potholes and rocks on the street, until Middletown. This is the last chance to get food and water until Clear Lake. Bring all the water you can carry. I followed Big Canyon Road, shown in the picture on the left, which winds its way through georgeous scenery with basically no traffic at all. The second half climbs some 400 meters though, and the temperature rose to about 40 degrees C, making it really tough, with ICY road signs to mock me. Two boys showed me the rattlesnake they had caught, and they demonstrated it by catching it again. I turned right on Seigler Canyon Road, which goes downhill until rejoining 29, which climbs some 70 m until the turnoff to Point Lakeview Road. There are numerous steep climbs here. I finally found food and water in Riviera. From here it's mostly downhill on Soda Bay Road with a few smaller climbs to Clear Lake State Park, which has a nice but rather exposed campground. The scenery on this day was absolutely beautiful, but the heat and the climbing made it very challenging. 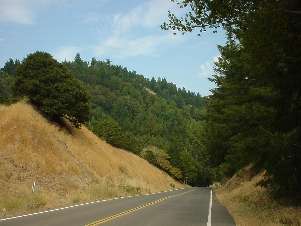 The picture at the top of this page shows the approach to Clear Lake on Soda Bay Road. 29. 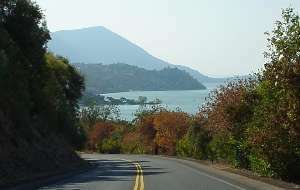 The next morning I continued on Soda Bay to Lakeport, a cheerless town with some restaurants and used-car lots. Turning right on 11th Street put me on Scotts Valley Road, a very scenic little road with almost no traffic and no climbs winding its way towards Highway 20. There is a Safeway supermarket on 11th, stock up here. Just before Highway 20 I turned left on Laurel Dell Road, which follows the left shore of the little lake while 20 follows the right. 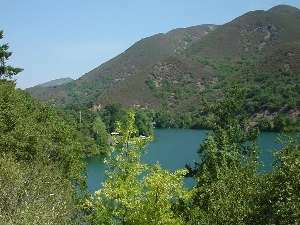 There are several moderately steep climbs but the reward is a quiet scenic road with many views of the lake, such as the one shown in the picture to the right. I reached Leggett on my last spare tubes. The small grocery store at the end of town carries patch kits - clearly I have reached the Pacific Coast bicycle trail. Since the Redwood Hostel is no more, I stayed at the Standish-Hickey campground just north of Leggett on 101. I spent an hour swimming in the warm and beautiful Eel River that expands to a small lake there, with the mountains all around me glowing in the evening sun. I brought swimming trunks along specifically for this park. 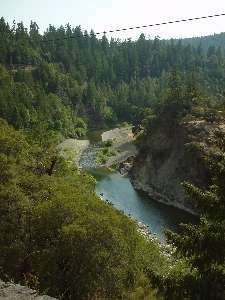 The left picture below shows a section of Eel River near the campground, as seen from above from highway 101. 31. As always on these tours I found that I was ahead of schedule, and decided to take the day off. I rode north to Richardson Grove State Park. 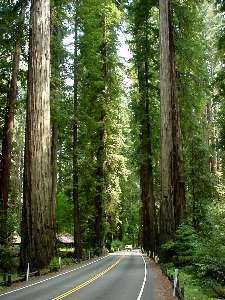 It has an old-growth redwood forest with nature trails, swimming holes, a small shop, and other amenities. If you have more time, you should go farther north along the Avenue of the Giants, and stay in the Marina Garden Club Grove before turning back. 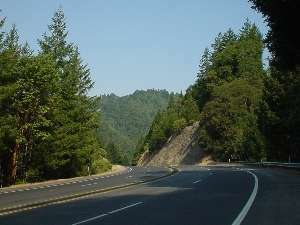 The right picture above shows the redwood trees along highway 101 near Richardson Grove State Park. Eventually I returned to Standish-Hickey, where I had left my tent. More swimming in the evening. 1. The next morning I went over Leggett Hill, which is considered the hardest climb on the coast, but after my inland tour I was not easily impressed and had no difficulty whatsoever. The ascent is cool, in the shade of huge trees, not very steep and not too long. Due to the forest there were no good views of the valley. The downhill brought me into foggy and much colder weather, and I had to put on several layers of clothing. Rockport hill immediately follows Leggett Hill; it is steeper but much shorter. The rest of this day followed the coast, with many little ups and downs. I got lunch at Westport, a small town that seems headed for extinction but has a grocery store and deli. The weather stayed overcast with only a little sun, but I had finally escaped the fast and heavy traffic on 101. Highway 1 is scenic and quiet. I spend the night in MacKerricher State Park, which has an excellent hiker/biker site. I got there before 14:00 but I didn't want to arrive in San Francisco too early. 2. Old Haul Road runs alongside the ocean from the campground until it meets highway 1 at a parling lot at Fort Bragg. Fort Bragg is a cheerless lumber town, but I found a very nice coffee shop one block north of the tourist info. There is also a bike store one block north-east from the Safeway near the end of Fort Bragg that opens at 10:00. 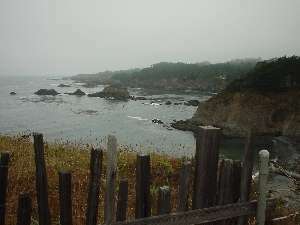 The road follows the Pacific ocean with many views of rocky cliffs, small beaches, and windswept rocks out in the sea. Unfortunately the sky was overcast all day. The road is a series of small climbs and dips as it winds its way into and out of river mouths, but none except the one shortly after Elk is very steep. The guide book recommends the Manchester State Beach campground, but it has no showers so I decided to ride on to Gualala, a somewhat dilapidated tourist town with a large supermarket and numerous motels. Since Gualala is close to the Bay Area, prices are high. 3. The next morning, there was low fog and a slight drizzle until noon. (Come on, if I want that kind of weather I can go to Hamburg, I expect California to do better than that in early August!) The scenery was pretty much the same as last day. If you do this for the first time, check out Fort Ross, an old wooden Russian supply fort. I stopped for lunch at the fancy River's End restaurant in the tiny town of Jenner. I don't think they'd make it very long in Paris but it was a delightful respite from the usual deli sandwiches. 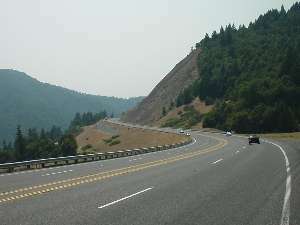 The road continues over rolling grasslands with frequent views of the rocky coast, like in the picture above, until Bodega Bay, where it heads inland. Bodega Bay is a major weekend holiday destination, so the traffic got more heavy here. There are two small hills to climb until Tomales; from here it's flat until Point Reyes, a pleasant small town with grocery stores and restaurants. I left highway 1 in Olema and turned left on Sir Francis Drake, and then followed a very nice bicycle trail that begins just before the Lagunitas Creek bridge into Samuel P. Taylor State Park. Their secluded hiker/biker site on the wooded hill slope is really nice. 4. Sir Francis Drake continues inland to Fairfax, along a series of grassy hills dotted with trees. For the first time in two days it was warm and sunny. Just after entering Fairfax, a series of green Bike Route signs led me through a sequence of quiet residential streets, roughly paralleling Sir Francis Drake until rejoining it. Shortly after I turned right on Lagunitas and immediately right again, but instead of following the complicated path recommended by the guide I stayed on Magnolia and Camino Alto until the Sausalito trail begins near Blithedale. Slightly more climbing but far more scenic and there is no way to get lost. I stayed a while in Sausalito, at the ferry terminal across from the ice cream store, and gazed over the bay to San Francisco as I always do here. I left for the Marin headlands around 15:00 because their visitor center closes at 16:30, and I wanted to stay at their awesome Bicentennial hiker/biker camp. To get there, climb south out of Sausalito, then turn right on Bunker Road through the tunnel. 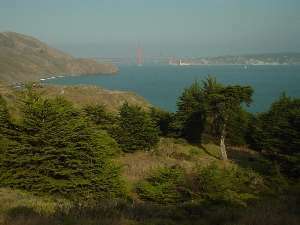 Just above that campground, there is a picknick area from which you see the small campground, the Bay, Golden Gate Bridge, and San Francisco in the distance spread out in fron of you, as shown in the picture on the left. Absolutely gorgeous. They have a lighthouse and some abandoned military sites, including a missile site, in walking distance. Unfortunately you can't see much from the campground itself because some trees are in the way. You must have reservations for the Bicentennial (there are also less scenically located campgrounds nearby); rangers came late at night to check our permits. This day I got lucky and got excellent visibility, the fog had completely disappeared. For showers and amenities, go to the nearby hostel, they accept the camping permit for a small fee. 5. The end of the tour. I rode the short distance into San Francisco across the Golden Gate Bridge and checked into my hotel (the Triton, I love this place and always stay here. They do bicycle valet parking.) If you want to linger here, check out the Golden Gate Park and Haight Street, and the bike stores on Stanyan. Definitely forget the Fisherman's Wharf area.